In my previous post (Crawlable AJAX Applications) I discussed how to get your ajax-driven app indexed by search engine crawlers and spiders using the hash-bang method. Now I intend to extend that topic by covering the HTML5 History pushState method. Pushes the given state onto the session history, with the given title, and, optionally, the given URL. A state object is an object representing a user interface state. When user navigates to a new state the popstate event is fired, and the state property of the event is equal to the history state object. (currently ignored) A title for the state. (optional) URL for the state. Both absolute and relative url's are accepted. The popstate event is fired every time the current history entry changes. 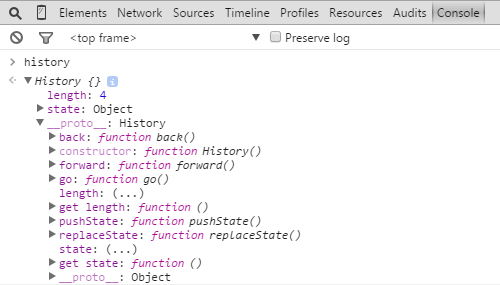 That happens when the user click on browser's Back/Forward buttons or programmatically by calling the history.back(), hitory.forward(), history.go() methods. The next example demonstrates how the real single page app should looks like. See our working pushState demo. Source code is available on this GitHub repo. You should differentiate the requests to the server and send proper content to the browser. For example: when request is made through XMLHttpRequest (AJAX requests) the response should contain only the requested content (specific portion of webpage). For regular requests you must sends whole webpage, e.g. html, head, body + page content. In conclusion, since modern browsers are widely used, you should consider using the HTML5 pushState for building your killing single-page applications, and use #! hash-bang method if you intend to support old browsers. In fact, Facebook uses a dual approach - hash bangs for IE9 and pushState for modern browsers. Share this post, then leave me a comment below with your thoughts about single page applications. Thanks so much for reading! Nice and simple demo you've made from this. I have a small question tho'. In your anchors you have this <a href="africa">africa</a> How do you load the content from the africa file without an extension? I can make it work with an extension such as africa.php in my own environment, but if I do a page refresh then it loads only the content of africa.php in the browser. How did you tackle this in your tutorial demo, because there a hard page refresh loads the content of africa in the #content div? I've used a .htaccess file to rewrite the URLs. But the most important is when you do AJAX requests to exclude the additional data from the response, e.g. header and footer. I might look into your PHP snippet and try that too. Hi Dimitar! Great helpful article. Thanks for that. Is there any way to use JQ only to load necessary page after refresh? I'm writing little site with 3 pages and don't want to use any back-end (all of the content is loading via load() function of jq). Thanks in advance! I can't get it to work. i'am stuck at the .htaccess file. Can i download the whole example somewhere? By any chance, could it be possible that you upload on github the full working demo, along with the htaccess? Il would be more than helpfull for many people. Dimitar, but this way you must have two differents programs, right? The program with all the content (header and footer) and the program with just the content... this way if you want to change the content just be aware to change both programs, right? And if is a system full of functionality I think this way will be a nightmare. What do you think? Indeed, this isn't necessary. If you're using a server-side language (PHP, Python etc.) you can easily split your codebase into separate files. That way the need to update your content on multiple places will disappear. See the example on the GitHub repository. What's the best way to structure some of the country directories in subdirectories of the domain? such as example.com/east/asia. Thanks!